The first time I heard Nasario García speak, he told a story about his abuela, his grandmother who lived beside a river that once ran. The Río Puerco. As he spoke, I began to see where he grew up—four Hispanic villages on a dry plain—and hear the stories of the elders, the viejitos. Soon after, I adapted his first book of oral histories into a play. A year later, I began directing a documentary about him called Nasario Remembers the Río Puerco. 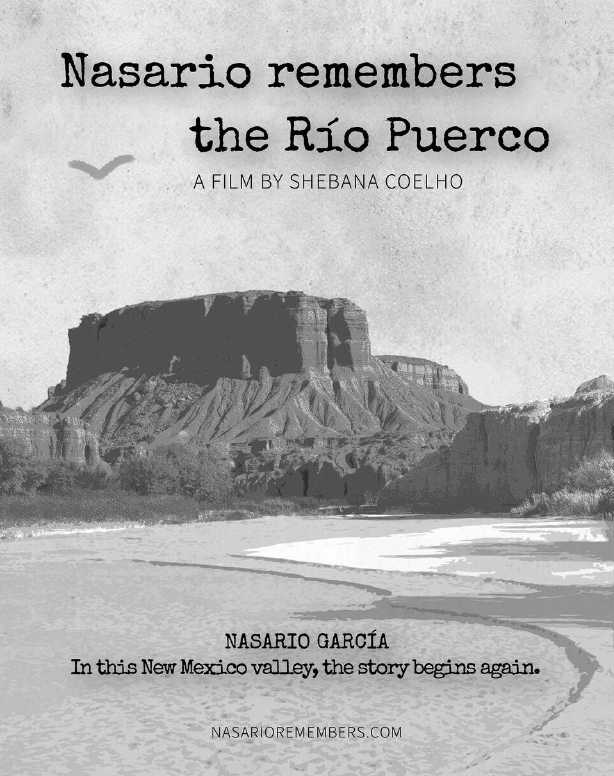 For over 30 years, Nasario García has been sharing award-winning bilingual stories that he has collected, recorded, remembered, and reimagined about the life and people of New Mexico’s Rio Puerco valley (southwest of Chaco Canyon) that thrived between the 1900s and the 1950s. To work with Nasario—for about five years now—is an experience in generosity. He understands that your vision of a story, even if it is his story, is an encounter between your imagination and something mysterious and he lets you be, lets the story be so it finds its true manifestation. Every time we returned to the Río Puerco ruins to film, Nasario saw all that had been eroded, and was no longer there. For me, everything that was lost was found again in his stories. And so we followed him, in story, in silence, to mesas and caves, and once, to a throne of rocks where he sat and suddenly yelled a barbaric coyote yawp. I knew the film needed to begin right then and there, in that moment, and it does. The film was broadcast in October 2017 on New Mexico PBS/KNME. Side by side with responses about the preservation of Hispanic heritage of New Mexico were responses that spoke to our universal belonging to land, community, and storytelling. “You brought me a history that isn’t my own,” was one comment, “but for which I get homesick.” I understand that sentiment. I grew up in India, and lived most of my life in cities until I began to travel in wild open spaces and after many years of wandering, grew roots in New Mexico. In this encounter with Nasario García, in the memories he shared, in dust of the river and the stillness of the llano, I heard a story too, and I spoke it in film.